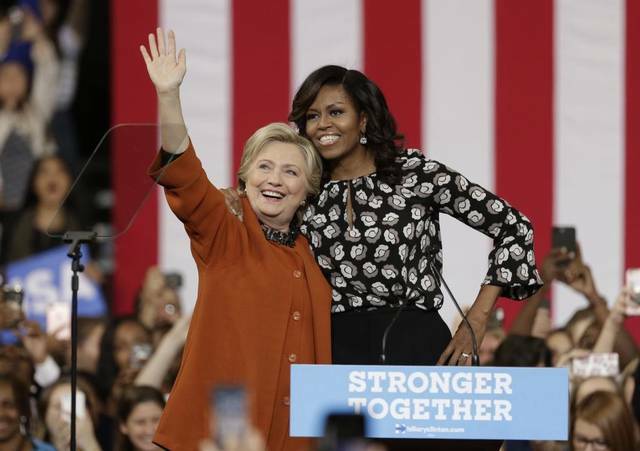 * After Michelle Obama’s powerful speech in New Hampshire, a friend of mine said that FLOTUS was her new hero. I agreed – but said that she had become a hero of mine way back in 2007 when she gave this speech. Take a look to remind yourself that she’s always been a strong voice speaking out and lifting us up. * It’s hard to know how things in Congress will shake out after the election. But this strikes me as one of the most consequential battles this country has faced in a long time. Senate Republicans are choosing sides ahead of a brutal conflict over how to handle the lingering Supreme Court vacancy, with Jeff Flake firing back Thursday at a suggestion by Ted Cruz that the party could indefinitely block any nominee from Hillary Clinton. The internal GOP battle over what to do about Merrick Garland — President Barack Obama’s choice for the court — and any future Clinton nominee will dominate the lame duck session of Congress after the election. Senate Majority Leader Mitch McConnell (R-Ky.) is holding the seat vacant for the next president — but Cruz has suggested that Republicans could continue to block Democrats from appointing a new nominee for much longer. That’s a strategy that doesn’t sit well with Flake, a fiscal conservative from Arizona who’s shown deal-making tendencies since joining the Senate in 2013. * I guess it shouldn’t surprise us that the news about Trump’s sexual assaults will be followed by other public figures being exposed. Four people who knew Smith at the time confirmed to National Law Journal that they recalled her recounting the incident to them soon after it happened. * The Obama administration continues it’s progress on the Clemency Initiative. * Finally, it’s true…the kids are all right. So you should listen to them already.